Onboarding is one point in a longer journey that begins in the app store and ends with the user taking the first key retention-correlated action in your app. We can consider onboarding to be a useful UX technique to present your product to potential users, it is defined as a way of making someone familiar with an app. Your apps may not be self-explanatory so they surely need to include onboarding. Now that you know what onboarding is, we’ll dive into this tutorial. I’ll show you how to build a nice onboarding experience for your mobile app using the Flutter framework. This is the final result of the tutorial. Nice isn’t it ? 😎 You will be able to achieve that at the end of the tutorial. Open your code editor and hit ctrl+shift+p or cmd+shift+p to create a new project, and give it a name, or simply run flutter create your_project_name in your terminal to quickly create a new project. After that, you’ll end up with a fresh Flutter project. In the dependencies section of the file, we’ve added the transformer_page_view dependency, a page transformer plugin for Flutter. This will help us to build our onboarding screens with no hassle. Create an assets directory into the root of your Flutter project. You can find the content of this folder at this link. Don’t forget to run flutter packages get in your terminal to install your dependencies. Here’s the code for the screens. Kindly paste it in your main.dart file. First, we import the material library so that we can use the MaterialApp widget inside our app. We’ve also imported our transformer_page_view_dependency. Now inside our main function, we have our MyApp widget returning the MaterialApp widget defining our app title, our app theme, and our MyHomePage widget. controller: an object of IndexController to get some useful info about indexes of screens and to control them. transformer: the most important property of this widget, it returns a transformed widget that based on the widget parameter. The returned widget as it happens is the current screen presented to the user, just a Material widget wrapping two texts widget and an image asset. We wrapped each of these widgets inside a ParallaxContainer to mimic a parallax effect on screens swiping. itemCount: number of total items/screens. So here are the four screens you should have if you have followed along 🙃 . Just execute this command: flutter run in your terminal to run your app running with a smooth transition between screens 😎 . In the next part of the tutorial, we’ll add carousel indicators to the slides to make it more user friendly. 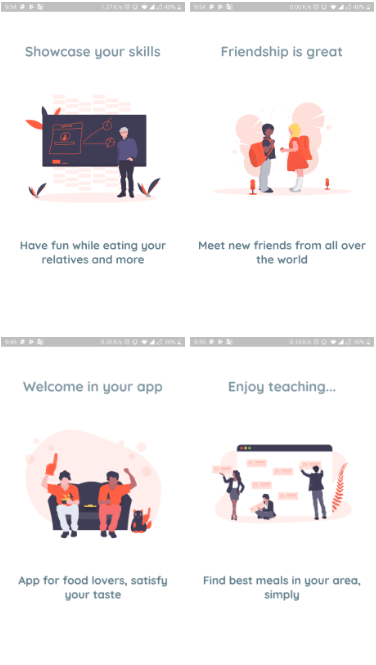 In this first part of this tutorial series, you’ve learnt what onboarding is, then we’ve put this knowledge into practice by building the screens of our app intro. This is just the first steps of a beautiful journey 😉 . Follow me in the second part to see how we can polish the app with the carousel indicators and get more control over the app. Here is the code for the first part of the series.